Journey of a lifetime! Finally getting those ducks in a row! This 41-day, trans-Atlantic cruise has been booked for months and I can’t believe it’s now only 1 1/2 weeks away! In just 11 days a group of 30 random people from my hometown in Texas will board The Mariner of the Seas in Galveston to begin an exciting voyage half way around the world — from Galveston to Singapore! Of course, thousands of other travelers will also board. At first the mere thought of packing for such an ambitious undertaking seemed insurmountable. After brainstorming with a few friends and doing some online research, the lightbulb finally came on. It suddenly occurred to me that packing for 41 days with the idea of flying back was truly impossible. However, my eyes suddenly opened with the realization that this voyage is literally three, two-week cruises combined to make one voyage. So, all I need to do is pack for one, two-week cruise, then recycle everything for the next leg and, finally, the last leg of the cruise. Ta-Da! Now I’m ready to put this packing dilemma down. Now, to take this idea of “packing light” one step further. One of my friends suggested that I consult an online list for packing light on http://www.rIcksteves.com, so I did. This list is not specifically for cruises, so I’ve had to modify somewhat, but it’s very helpful. Rick Steves suggests that you pack for 4-5 days no matter how long your trip. It’s a little different when you’re on a cruise because of the variety of activities calling for both casual and dressy attire. A big sigh of relief! Packing for two weeks is the plan — including medications and toiletries for six weeks is manageable. 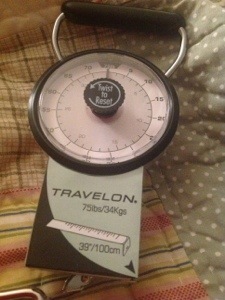 And, we’ll be packing a hand-held scale to weigh the packed luggage before heading to the airport in Singapore. ← Fun packing for a 41 day cruise — So many questions! Trilla…Have a safe and wonderful trip!! We cruise 5 or 6 times a year and I have packing down to a 15-minute chore! Leggings are the answer! Two pair of black leggings, a nice pair of black slacks, a pair of white or colored jeans, 6 nice tops, one sparkly dress and one or two sparkly tops, and a knit dress. If you work out, two T-shirts (one can be drying after being hand-washed while you wear the other) and a pair of workout/yoga pants. I take those laundry sheets (they are impregnated with detergent, but look like a stiff dryer sheet) and wash my lingerie, leggings and other washables as I go. I take a pair of pretty sandals, a dress pair of shoes and Keds tennies, which I can wear to walk or workout in and to excursions. I also carry a light wrap that is waterproof and I take lots of extra hangars, an electrical plug strip (to plug in multiple things like phone, iPad, hair appliances, etc. Depending upon the itinerary, I might also take a hat, swimsuit and coverup, or a sweater/jacket. You will love the Mariner…please give Bee and Marco and their casino staff my regards. They are awesome! Also, be sure to ice skate in their little rink and if Jeff Trachta does his show, do NOT miss it! The Temptations tribute band was also great. Have a wonderful trip!